Go for a soothing color for the walls, such as blue, which creates a feel of ease-into-sleep in the room. Place a good piece of art on a wall. Pick up a favorite photo of your child and enlarge it to a standard height of the frame, at a nearby office supply store. Adorn a dresser using the remnants of colorful ribbons. This is a great way to upgrade it instantly at no cost. Another great way to decorate a kids’ room is to use die cut decorative items like flowers, laces and other designs cut in paper or fabric. You can also create scrapbooks using die cutting and display them in the kids’ room. Dies are available in different designs, which are created from die board cuttings. If you are good at die cutting, you can come up with amazing decorative items to display in the kids’ room. Create a good, warm space for shared reading time. Go for a bookcase filled with favorite books, cuddle-worthy seats, and ample lighting. Hang a string wire on the walls to showcase the masterpieces of your child in an inexpensive and smart way. Alternatively, you may feature your kid’s artwork using clear frames of acrylic, which you can update when new art pieces are made. Consider covering storage closets with magnetic boards, light boxes and mirrors, providing kids with more ways of playing, like indulging in wordplay, displaying projects of art, tracing images, and other ways of getting creative. Consider giving an “office” space to the children also, a discrete space for them to do their homework. Don’t go for spending on new containers for storage when it’s possible to use what’s already there. For example, potato chip cans may serve as storage bins. You simply need to apply some mailing labels on them. 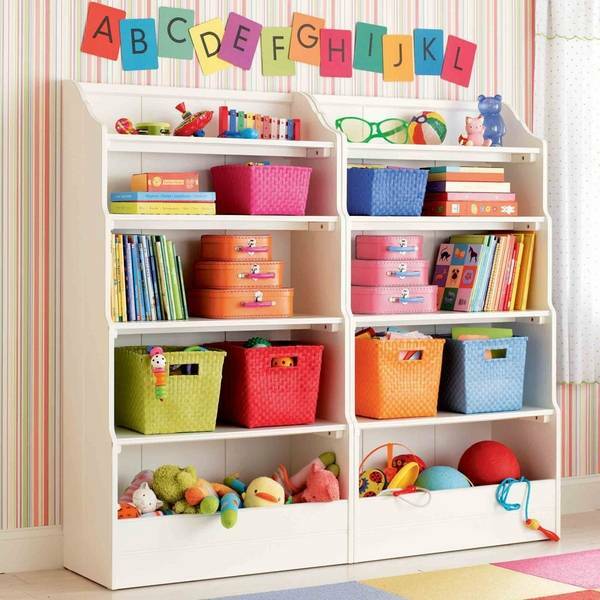 Use a portion of a bookcase for stowing toys neatly. Eliminate any guesswork by using clear containers for storing toys. Use curtains for hiding the items stored in the bookcase. Go off-the-grid while using a coatrack mounted on the wall, which is also suitable to be used as a hanger for coats, play gear and art supplies. Place lettered blocks on shelves or closets, spelling out the names of the occupants of the nursery. Place some toy animals also along with the lettered blocks. Make the room a dual-function one and use a relaxing, simple color scheme in it. A dresser can serve as a changing table as well as a storage space for the office supplies. With these tips, you can go ahead and proceed with the venture of decorating your kids’ room. These are easy to implement ideas that don’t need any substantial investment. Employ the tips and see how your kids find the upgraded room to be really fascinating! Write of this post Mia Jones lives in California. She is working as a Content Developer in Advanced Die Supplies, Inc and she likes to share her wisdom about dieboard in her blogs.